There are 14 blog entries for April 2011. Friday, April 29th, 2011 at 9:42am. WASHINGTON — More Americans signed contracts to buy homes in March, but sales were uneven across the country and were not strong enough to signal a rebound in housing. Sales agreements for homes rose 5.1% last month to a reading of 94.1, according to the National Association of Realtors' pending home sales index, released Thursday. Signings are more than 20% above June, the low point of the housing bust. But the index is below 100, which is considered a healthy level. Contract signings are usually a good indicator of where the housing market is heading. That's because there's usually a one- to two-month lag between a sales contract and a completed deal. Thursday, April 28th, 2011 at 11:40am. I was just surfing online at the "Honolulu Star Advertiser", our local newspaper and ran across a link to an online version of "Hawaii Renovation" magazine. "Hawaii Renovation" magazine is published every week and is a great resource for those homeowners interested in redmodeling, home improvements and other related projects. Now you can access the magazine online here! Tuesday, April 26th, 2011 at 3:51pm. Monday, April 25th, 2011 at 12:38pm. Monday, April 25th, 2011 at 12:18pm. RISMEDIA, April 21, 2011—Sales of existing-home sales rose in March 2011, continuing an uneven recovery that began after sales bottomed last July, according to the National Association of REALTORS®. Existing-home sales, which are completed transactions that include single-family, townhomes, condominiums and co-ops, increased 3.7% to a seasonally adjusted annual rate of 5.10 million in March from an upwardly revised 4.92 million in February, but are 6.3% below the 5.44 million pace in March 2010. Sales were at elevated levels from March through June of 2010 in response to the home buyer tax credit. Friday, April 22nd, 2011 at 7:50am. While making my way to take pictures of the San Jose Penthouse in Axis Highrise I found a new restaurant that had great food. 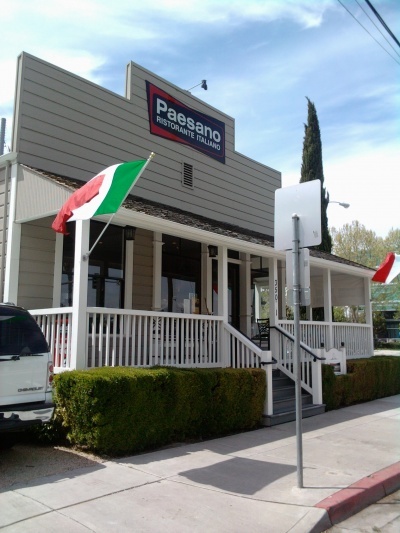 If you like Pasta Pamodoro or the Spaghetti Factory you will love Paesano Ristorante Italiano! This great eats is located next to the Hi-Life BBQ spot in one of the newly renovated historical homes, or the corner of Julian. It has a wide, wraparound front porch with seating on warm days and nights. Inside, the look is classy with dark wood floors, white tablecloths and black-and-white photos adorning the walls, showing people on Vespas and men in bowler hats playing bocce. They were busy when I went but it was a lunch rush and the location to downtown makes it convenient for the central San Jose office workers. Monday, April 18th, 2011 at 11:15am. According to the Honolulu Star Advertiser newspaper "It's been relatively calm on Hawaii's home foreclosure front during the past several months, but the storm could soon return." "Foreclosure activity in Hawaii real estate declined for a fourth consecutive month in March, falling 37 percent from a year earlier, according to a report industry research firm RealtyTrac released yesterday." Thursday, April 14th, 2011 at 10:57am. 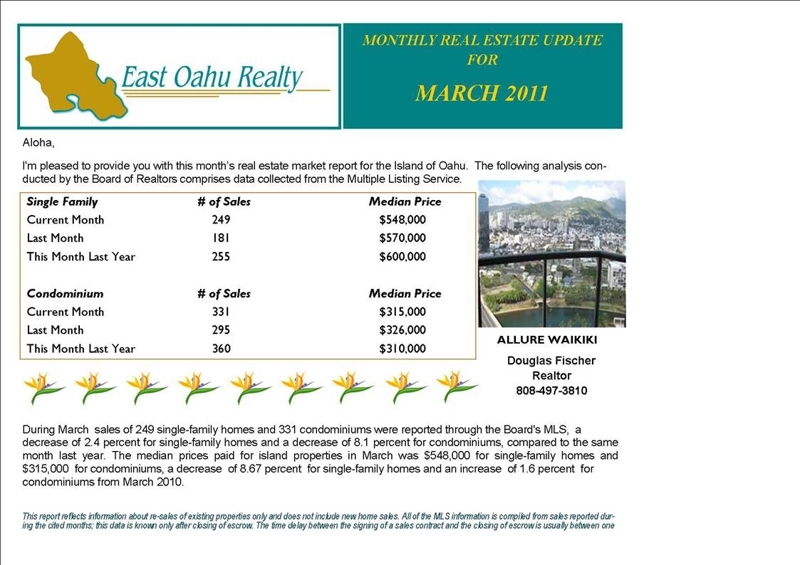 Here are the latest statistics for sales for the last Quarter for Keola Lai, Honolulu Luxury Condominiums. Friday, April 8th, 2011 at 11:22am. Allure Waikiki Condos - Renovations? 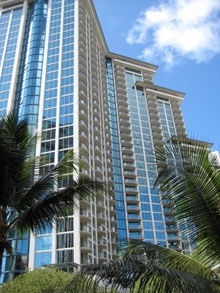 Although this new condo building, Allure Waikiki, located in west Waikiki was just completed a little over a year ago, after buying bought out by a private equity group, I've been reading "rumors" concerning planned renovations. I say "rumored" because I have not been able to verify it through the Allure website or sales office, but have read news reports about it online. 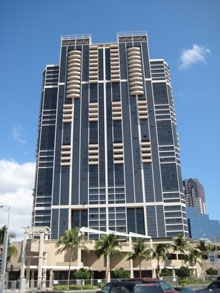 Evidently, not only is the luxury Waikiki condo building, Allure Waikiki, going through some price restructuring, but may be planning a reported $3 million in renovations to help move the remaining 100 or more unsold condo units there. 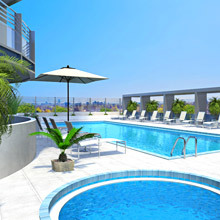 Renovations could inlude lobby, community rooms, pool deck and the BBQ areas.